I’m excited for some great cremes and glitters- which this collection will totally have!!!!!!!! For nearly 40 years, AII has been the leading manufacturer and worldwide distributor of innovative, quality beauty and skin care products for men and women. Our product lines include Ardell, Andrea, Body Drench, Bye Bye Blemish, Checi, China Glaze, Clean + Easy, Clubman/Pinaud, Duo, European Secrets, EzFlow, Fright Night, Gena, GiGi, Gypsy Lash, IBD, Jeris-Lustray, No Tweeze/Micro Tweeze, ‘N Rage, Prolinc, RAW, Seche, SuperNail, Surgi-Care, Waterworks, Winning Nails, Woltra, Woody’s, and Youthair. For more information, visit our website: www.aiibeauty.com. 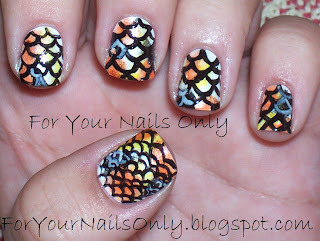 Don’t Be Coy, Be Koi! Being that life has been so hectic (but in a good way) I felt like doing a Koi design for you tonight. Unfortunately, it didn’t turn out as well as I would have liked but I didn’t have time to go back and redo it. Needless to say, I hope that you enjoy it and that it brings you good luck! For this design I used OPI Natural Nail Base Coat, Alpine Snow, Ya’ll Come Back, Ya Hear, Black Onyx, Cabana Banana, I Only Drink Champagne, and Rising Star. I topped with a coat of Seche Vite. 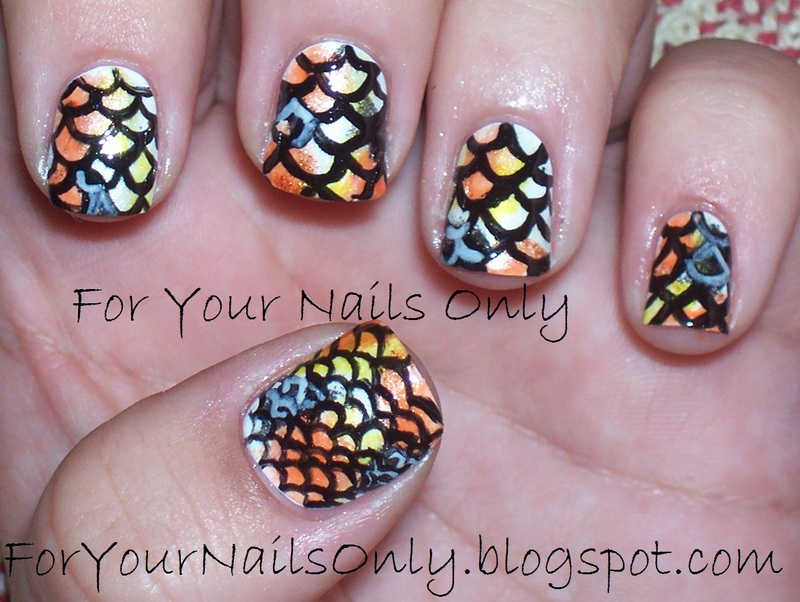 The thumb was supposed to be an accent nail with smaller scales…..
And to satiate your nail art desires, I decided to post another design I did, a few weeks ago actually that I liked but I wasn’t feeling well so I only took a few pictures and thought they were all blurry. As a result, I gave up on posting it, but I found one that wasn’t too bad so you get to see it too! I wasn’t going for anything other than abstract, but it sort or reminds me of burning leaves. For this one, I used OPI Natural Nail Base Coat, China Glaze Papaya Punch, China Glaze 108 Degrees, and OPI Cabana Banana, and OPI Black Onyx topped with Seche Vite. 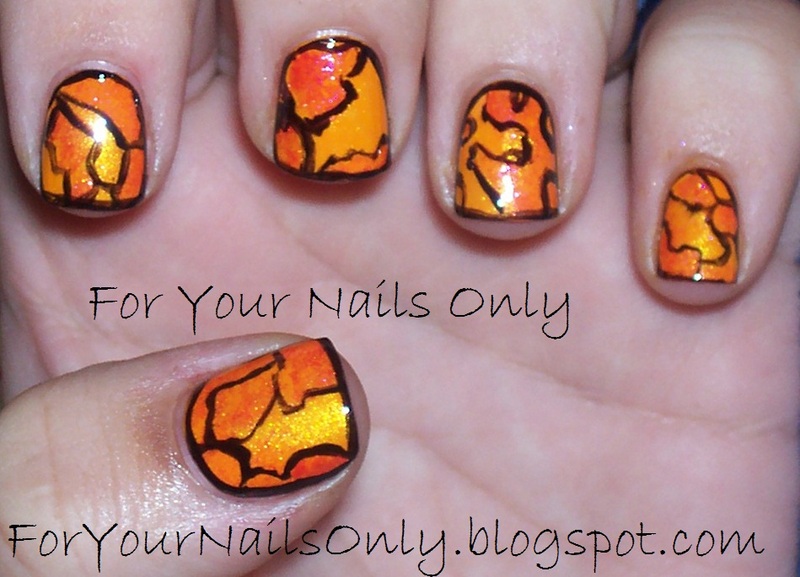 The shimmer of the polishes blended quite well with sponging.